Founding fathers of the New Romantics and pioneers of the 80â€™s sound, Visage, return with a new album 'Hearts And Knives'. â€œIt has been 29 years since the last Visage album and during that period it often seems like we have all lived through several lifetimesâ€ comments Steve Strange, the bands creative force and flamboyant leader singer. Their breakthrough track â€œFade To Greyâ€ became a European hit and reached number 1 in eight countries in 1980. The band then enjoyed a series of hit singles â€œMind Of A Toyâ€, â€œNight Trainâ€ and â€œThe Anvilâ€ coming from a pair genre defying albums, the eponymous â€œVisageâ€ in 1980 and â€œThe Anvilâ€ in 1982. In 1981 Ultravox now led by Midge Ure took off and in 1982 Midge and Billy left to concentrate on what would become one of the biggest bands of the 80â€™s. In 1984 Visage made their 3rd album â€œBeatboyâ€. As the public face of the band Steve Strange shot to stardom throughout Europe he continued to be active in hosting club nights (The Camden Palace, Club For Heroes) and in the fashion world. In 2010 Steve reconnected with Steve Barnacle and began writing songs once more. Some time later ex-Ultravox guitarist Robin Simon joined the equation, bringing not only a large slice of shared musical DNA (that â€œVisage soundâ€) to the project, but also his own distinctive style and ethereal musicianship. Vocalist Lauren Duvall was invited into the fold, adding not only her sultry vocal ability but a slice of the classic Visage glamour too. With the core members in place the picture slowly started forming and the band reached out (once again) to Martin Rushent. He suggested the blueprint for the album and had began working on the first tracks before his untimely death in 2010. The â€œHearts And Knivesâ€ album is dedicated to Martin. The album features collaborations and contributions from Dave Formula (former Visage and Magazine keyboard player) , Mick MacNeil (the former keyboard player and creative musical core of Simple Minds), 80s super producer Youth, Rich Mowatt and Logan Sky. 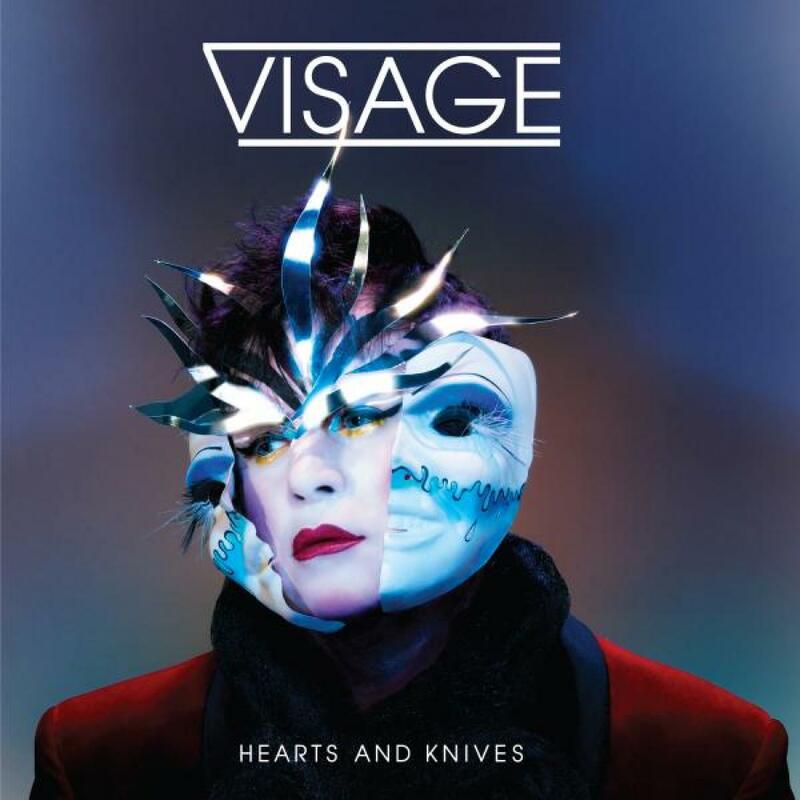 The sound of Hearts and Knives is â€œclassic Visageâ€ but with modern songs and style. There is the odd tip of the hat to modern production values but the sound is 1980-1982 Visage. It's Vintage keyboards and synthesizers all the way. There's not software synths on this record! The production by John Bryan and analogue synthesizer collector Sare Havlicek is firmly rooted in the 80â€™s. Many tracks of the tracks are instantly recognizable as Visage (Moogs and the obligatory CR78 drum sound feature on several). Visage (French for â€œFaceâ€) has always been one part music to one part style & fashion. In 1980 the explosive combination of then futurist synthesizer music, fashion, make up & gender ambiguity set the blue print for the New Romantic movement and eventually the style template of the 1980's. Visage was one of the bands to evolve out of the famous night club the Blitz Club, created and hosted by Steve Strange and Rusty Egan. Other bands included the infamous Spandau Ballet and Culture Club. Innovative style, clothing and make-up continue to be central to brand â€œSteve Strangeâ€. In a series of style looks for the album he has collaborated with designers Haus of Gaga, Sorapol, Mark Fowler and long time collaborator milliner Stephen Jones OBE. The first album cover in 1980 was shot by veteran music photographer Peter Ashworth in the Blitz Club. Peter returns to shoot the cover of the fourth album. The shot references the famous â€œFade To Greyâ€ white face & water motif now displayed on a mask created by Lara Himpelmann. The current day Steve Strange bursts through the mask in a blaze of sliver & red. â€œHearts and Knivesâ€ may have been a long time in coming but it is a purposeful statement of just where Steve Strange and Visage are at present. The past has been full of highs and lows but musically & creatively they are at a point where they can confidently present an album containing all the strands of their unique mix of music, fashion and style. 01. Written by Steve Strange, Robin Simon, Sare Havlicek, John Bryan, & Rich Mowatt. 02. Written by Steve Strange, Robin Simon, Ben Woods, Nigel Summers, John Bryan, & Rich Mowatt. 03. Written by Steve Strange, Mick MacNeil, John Bryan, Josh Legg & Kyle Petersen. 04. Written by Steve Strange, Steve Barnacle, John Bryan, Sare Havlicek, Julie Scott & Rich Mowatt. 05. Written by Steve Strange, Robin Simon, John Bryan, Guy Hatfield & John Graham. 06. Written by Steve Strange, John Bryan, Mick MacNeil, Arno Carstens & Martin Glover. 07. Written by Steve Strange, Robin Simon, John Bryan, Marco Di Carlo, Greg Benns, & Christian Kennerney. 08. Written by Steve Strange, Robin Simon, Sare Havlicek, John Bryan & John Graham. 09. Written by Steve Strange, Ross Tregenza and Dave Formula. 10. Written by Steve Strange and Steve Barnacle. Additional Keyboards & Programming :Logan Sky, Mick MacNeil , Sare Havlicek , Rich Mowatt, AM Additional Guitar: Nigel Summers (on Fashion). Additional Backing Vocals: John Bryan Drums: â€˜Wildcatâ€™ Will Blanchard & Sare Havlicek. Additional Engineering: Rich Mowatt, OD Hunte, Shuta Shinoda, Robin Twelvetree, Robin Lee, AM, Chevy One, Will Dardelin, Paul Richard Simon, Mike Patto, Martin Rushent. Front Cover Mask, styling & make up by Lara Himpelmann. Front Cover Photo Â© Peter Ashworth. Band Portrait & Centrefold Picture Â© David Levine. Artwork by Nick Foot. Track 6 Published by Dharma Songs / Sony ATV and Copyright Control. Track 9 & 10 Published by Dharma Songs / Copyright Control.